The New Earth Teachings (NET) give us an understanding and higher knowledge about our spiritual evolution and the shift that is happening from the “old” Earth to the New Earth. processes, ceremonies and meditations to help the Earth, ourselves and others with the shift. Each level of the New Earth Teachings comes with a special initiation and after receiving the initiation and the papers you will be a New Earth Teacher yourself! Currently, there are 9 classes in the NET sequence. Class 10 will include physical visits to the New Earth! Each level is $22 for the initiation and papers sent to you by email. The total package for classes 1-9 is $144. If you want to take the classes in person it will be $44 per level. In these wonderful moments there are a lot of signs and things that are happening that could be a little strange for us. That we could see and maybe be a little worried about what it could be. If you look up into the sky and you see signs in the clouds – if you see the clouds being different then they usually were before (not to be mixed with chemtrails of course) – or if you see the Sun being whiter and brighter than you have ever seen it before – or if you see spirals and sparks within the sky at noon or in the mid day, — this comes from the auras meeting. This comes from the beautiful touch between dimensions. It doesn’t matter what you have read or heard before about Earth’s transformation. Nor is it important, according to their telling, how it is supposed to happen or what it is supposed to look like. It is more important that you, in some way, have chosen to listen and be receptive to receive the information. Once you have received information it is up to your Higher Self to sort out the answers. Our Higher Self represents our Spiritual Wisdom and Consciousness on a Higher plane and it assimilates the information and sends back whatever is worth believing in. Often you will get a clear, positive feeling and some sort of a knowing feeling in that process. There have been many predictions on Earth’s development throughout the years, especially from the people in the spiritual communities. Sometimes these predictions have been about destruction, severely unfair, or they have been more of the utopian kind. Some have shown maps of new continents and other things in shifted places. Those predictions also say that most of the land will sink. They tell of flooding and disasters, except for the areas where they themselves reside. Others have spoken of how certain chosen people, including themselves, of course, will proceed and move forward to something higher. This higher something is often described in a rather grand, but woolly way. They may say that the people that remain will just cease to exist or that they will be condemned to live under terrible conditions. Again, others say that ships will evacuate all of Earth’s people and pick everyone up. There are other predictions saying that we will move into the inside of Earth, under the crust and without having a real sun. How come the psychics and the clairvoyants have so many different predictions and theories? How come they all see it so differently? So far many of them may have been known to be able to predict things correctly. So, the question is, how do we know who is right and who isn’t? When people ask me how correct certain things that they’ve heard or read are, I haven’t rushed in to either confirm or deny statements that others have given out. Most of the time I have chosen to say that everyone is probably right in their own way. Many of them have actually come close to an understanding of the information that they have been given and that is the point; that they have received the information. However, no present existing human being knows! No one has that ability. All information is received in different ways, but it comes from somewhere else, whether they read cards or look at signs in nature. The spiritually contacted or psychics often get visions of the future or psychic information. The visions are seldom complete, simply because our Higher Selves don’t even know. No one can be completely sure of the events of the future tapestry. Afterwards the psychics add whatever they feel is missing. That might happen unconsciously or very consciously. And in that case they may follow some sort of a pattern that worked before when they added things to get a correct statement. The psychics cannot do it in the old way, when they try to fill it in. That may have worked before the new evolution of ours and the existence of The New Earth. Now there isn’t any logic to lean up against because when working with another dimension, things are too fine tuned and subtle. It is too big and complicated to understand with our logic how a whole planet can be moved into another dimension. It is also too difficult for a person to be able to have an overview of it all, since a Spiritual Evolution is much too big. I, myself, have had the great privilege and advantage to have an open dialogue, on a physical plane, with Universal beings of all kinds. Since I was five years old I have met the nice kind of Extraterrestrials, Angels, Archangels and Light Beings and I met them physically. All these beings have an understanding of all the steps in Earth’s development and they also have so many more answers to all the questions of life. The benefits are tremendous when you have real physical contacts and can sit down to talk and discuss things with them. Then you can fill in the gaps after a thorough study of examples where everything is completed. They even let me go to other planets that had already gone through their spiritual development and transformation the same way as our Earth is about to do it. Of course Earth is not the first planet to go through this phase in its development. Millions of planets have done the same thing. Remember that these superbeings were once where we are about to go now. The New Earth already has inhabitants. They are the people, animals and plants who died recently on our present Earth. 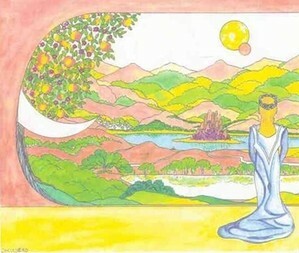 (You can already, via meditations, try to connect with your dear ones, who according to our ordinary way of viewing it, died here on this Earth.) When we are on New Earth we will meet our “deceased friends” again and then we will exist on the same physical level as they do. This will take place on a more finely tuned plane, on another level than our physical bodies of today. It will be like that because we will exist in a different dimension than we do now which, in turn, will make them and us look a little different after the shift. We will still be able to recognize each other though. Maybe people will even find their pet who died on Earth or their favorite tree that was chopped down, when they go to New Earth. The New Earth is 2,76 times bigger than the present one. It has new continents and other small and big changes from that which we are used to. India has an enormously beautiful archipelago that is made up of thousands of islands. Africa has a huge lake in its center. There is a completely new continent between Australia and South America. So maybe some of all the predictions with new continents and maps are true after all. It doesn’t mean, however, that they were created by erupting volcanoes, land moving around, earthquakes and other types of catastrophic events. Instead it means that our dear Mother Earth is choosing to take on a different appearance when she created the New Earth. Other predictions, you could say, are right as well. Some apparently common people will, by their own choice, leave the New Earth to go home to their home planet somewhere in the Universe. The reason for that is simply because their souls do not belong there and with Earth people. In the process that many have chosen to call Earth’s transformation or Earth going up to a different dimension, it is not about the present Earth changing or transforming herself. It is Her Soul that moves in to a new “body.” Our own Souls will make the change as well, although we will do more than that. We will do it in a more physical way as well. All the preparations have already started. The signs that are telling what is going on can already be seen inside of us, in our bodies and in our surroundings. Therefore the NET-classes are of immediate interest to make it easier for people to understand what is going on. We can take acupuncture, as an example. Suddenly it will be harder to find the points and give the appropriate treatment, because the chakras and the meridians have changed and, therefore, will affect the positions of the points. So, exactly how is this entire thing going to come about? Let me try to describe it. Imagine that it is a warm summer day. You are wearing a heavy, dark and soaking wet coat. It is totally out of fashion, uncomfortable and weighs down your shoulders and you feel sweaty and bad wearing it. Then someone comes to you and offers you a thin silk shirt in a light color plus a pair of matching light pants. Wouldn’t you gratefully receive these gifts and say, “Yes, thank you” right away? Surely you would want to change right away and take off the heavy and dark coat. Your answer would be “yes” for sure. So why wouldn’t our dear Mother Earth, as the living organism that she is, say “Yes”? In her case, though, it is not like a quick change of clothes. She will not suddenly and magically turn into a paradise and become exquisitely beautiful, pure and clean. No, it has been a long process with many different steps and phases. Most of them have passed long ago though. Mother Earth has created herself out of her own wish for perfection. Maybe some of the things that she looks upon as perfect will be a little bit unusual to us in the beginning, but this is the way she wants it. Her creation was assisted by God and all the Higher Powers, whatever names we choose to give them in different religions. Some of them we don’t even have any knowledge of. Other beings have helped as well such as nice extraterrestrials, angels and light beings. So, our dear Mother Earth has chosen to create her own new appearance and take on a new form which is bigger and very different in many ways. The choice was, and is, hers. When the process of the two Earths going through each other happens, everything stops. Everything and everyone that has gone up to a higher frequency will stick to the surface. Mother Earth will not leave anything or anyone. Everything needs to and must have the same high frequency as she herself has, otherwise it could hurt her. Therefore she prepares and changes us and she herself is going through that, too. Our present Earth has gone through a great many frequency rises of her ground energies the last ten years. The frequency in the earth lines has increased remarkably which, in turn, raises all the surrounding energies on the overall ground space. The energy then changes in everything that is alive because of that. It doesn’t matter whether they live on land or in the water. The nature, the animals and people are getting affected in a very strong way; an inevitable Spiritual Evolution. In everything alive, there is a process, in what you call the chakras. Those are also being affected in a strong way and they are changing their form and color. This is happening so that everything will be in harmony with the new higher frequency of the ground and the increased surrounding energy. The Earth’s aura is also changing its energy towards the Universe, which enables us to receive even more cosmic energy than usual. The whole solar system is affected and, even beyond that, positive things are happening because of our Spiritual Evolution. Our Mother Earth is a highly alive being, which means that she, too, has an aura. It is there even though we have hurt it by mining and even though we plugged it up with our cities. Her energy and aura are smaller than other planets’ auras because of everything we have done to her. (In NET-class part 2, you will learn how to clear the congestion that our cities have caused.) In spite of the damages that we have caused our Earth, her aura is enormously big and the New Earth’s aura is even bigger. These two gigantic auras met through the dimensions between the 21st and the 22nd of September 2003. After that, they are slowly passing through each other, layer by layer. Even the aura of the Earth has layers, although the layers of a planet’s aura are more complicated than the layers of a person’s aura. The layers of our present Earth’s aura consist of much more complicated things than layers of memories, patterns, colors, and such things. There are layers for the Death Kingdom, where you first go when you die. There are layers for the plant’s, animal’s and people’s group consciousness, etc. While the time passes it will be possible to, in a more concrete way, be able to perceive things when different layers goes through each other. For every important layer that is passed, it also has to be integrated and the information absorbed by the New Earth’s aura. From the beginning its aura and its “memory storage” were neutral. But not empty, because there was already life energy. If the aura of the New Earth bumps into negative layers or that which has a heavier vibration, these will not be picked up, simply because the energies aren’t the right ones. In any case we would not want to have them anyway. For example, when the auras and the layers meet where the animal group consciousness are, their hunt and prey instincts will disappear in their preparation for New Earth. Of course it has to happen at the right time and not too early, otherwise they would starve to death since they wouldn’t know how to handle the new situation. The substitute for their old food must be provided, which it will be on New Earth. Our present Earth, our dear Mother Earth, has a Soul and a Spirit as the living organism She is. These two have already started to leave us somewhat with a certain percentage. It started to happen already in spring 2002 and in 2003. Some people felt some sort of an absence from nature energies and flows in the nature. The desire to connect closely with nature and the soil disappeared partly. There was the feeling of not being in harmony with the ground and some chose to take a step back from connecting with nature. This meant that people weren’t as eager to go outside and dig their fingers in the soil or plant things as they used to be. Maybe it was blamed on other things, but the fact was that Mother Earth was more vulnerable during this time and needed to rest. What is the worst that can happen? That we people wouldn’t develop to the right level, the right frequency to be able to go into our Spiritual Evolution and reach the New Earth. Plants and animals don’t have a problem raising their frequency on their own so it would probably be pretty lonely if they went without us. In that case we would be left here with everything of a heavier vibration, rubbish and other useless things that would be left on Earth. Thereafter everything starts to fall apart, so that Earth can become new building blocks, which are news in the history of our present dimension. How likely is it that we would have such a dramatic ending? The answer is that the chance is extremely small. Our dear Mother Earth loves all Her children in spite of everything we have done to her. She wants to take everyone with her to the new. Also, all the processes are already happening, even inside of us and it is happening whether we want it or not. Good or bad, we will all receive the Spiritual Evolution, which can’t be stopped. Our chakras are changing, then the auras, and the way we look, and so on. Other beings would not let us be lost, either, especially not since Mother Earth wants us all. The nice extraterrestrials, angels and light beings would help us without hesitation and they will help anyway. They will help so that everything will happen smoothly. We will all gain something from developing spiritually. The faster this part of the galaxy gets harmony, the better for all beings that live here and in other planes and dimensions around us. Some people may wonder why we teach about cleansing in the NET-classes; a cleansing that will be made on and for our present Earth. Since we are leaving her, why do we do it? The cleansing is much needed. Heavier energies such as pollution and rubbish will make the process of Earth’s evolution slower and more sluggish. So we can help to make it easier. The NET-classes are there to awaken people’s interest and stimulate new ways of thinking. Even though some of the people who read this do not always agree with it or understand it, there will be a seed planted and some of the words will sink in about the New Earth. Once it is stored there in the memory, the information will give birth to new ideas and thoughts. So don’t sit around waiting for something to happen. It is better to do something; anything will do.